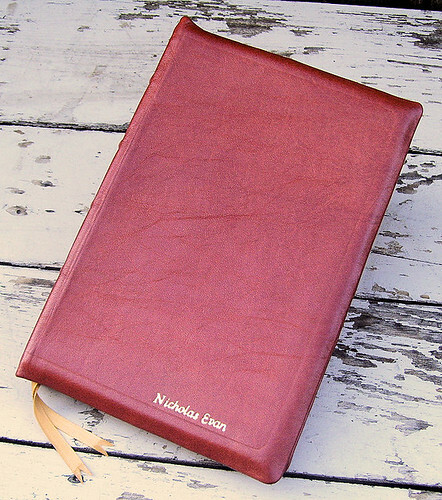 Nick Potratz recently purchased an thinline NKJV and sent it to McSpadden Bookbindery for a rebinding. Here, in his own words, are the results: I was browsing the latest selection at my local Christian bookstore a month ago, and I came across this Thomas Nelson NKJV thinline reference. 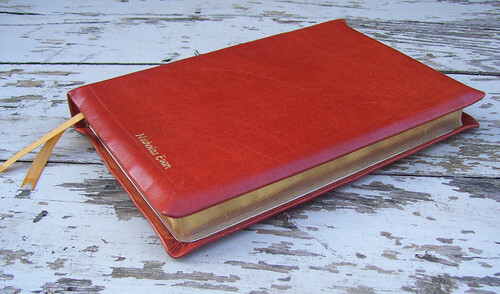 It had a brown imitation leather cover, but what really got my attention was the superior sewn binding. 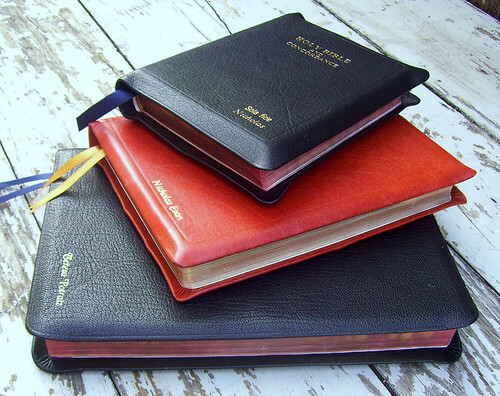 In fact, I was really surprised to discover that most of the low-priced Bibles that I looked at that night had sewn bindings! I think they are finally catching on that they need to offer quality bindings now, even in the low-end products. Maybe this website is partly to blame! 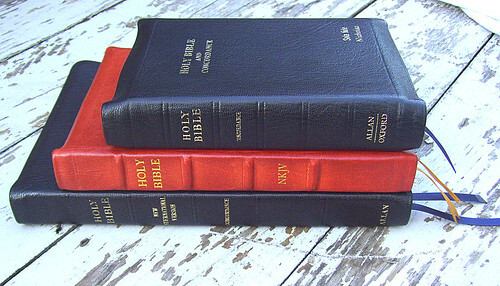 Above: Nick's rebound NKJV nestled between two R. L. Allan's editions -- the Ruby KJV on top, and an NIV on bottom, both in highland goatskin. I also really liked the verse-by-verse layout, because I need this format while following along with teachings, as well as sermons at church. So I purchased the NKJV Bible ($24) with the full intention of having it rebound by McSpadden. 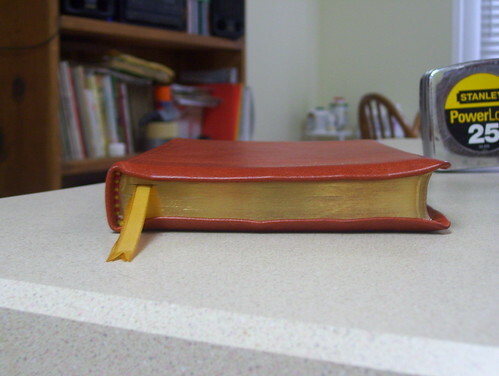 I had seen the photos of the NASB New Testament that Alan Cornett sent in to Mark, and was impressed with the color of the caramel calfskin that they used. I sent the Bible to Gayle and Corry McSpadden the very next day, and then called them three days later to discuss options. Gayle was nice enough to send me 12 samples (nice size pieces too!) of different color calfskins they have so that I could be certain what I was getting! So I finally decided to go with what appeared to be the same caramel color that was used on the NASB NT. It was a hard choice between that and a gorgeous blood red with the same grain, but I decided to save that color for another project! I specified raised bands, two gold ribbons, full-yapp covers ("turned edge" they call it), and "Holy Bible - NKJV" stamping on the spine. Gayle was very friendly and patient with me, as I no doubt seemed rather wishy-washy and annoying over the phone. Two weeks later, I received my Bible in the mail, sent USPS Priority. I couldn't have been happier with the result. The quality of the work was immediately apparent as soon as I pulled it out of the bubble-wrap that it was covered in. The yapp wasn't as full as I had wanted, but I suppose it is better this way because the contrast of the gold gilding against the rich brown/caramel color of this leather is striking. The grain on this leather is absolutely beautiful. The color of the paper is actually a slight cream color also, which contrasts very nice with the gold stamping/gilding/ribbons and rich brown of the leather. 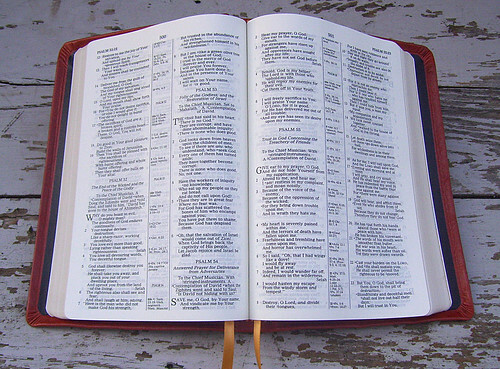 The lining used is a very strong synthetic material, and it is very strongly bonded to the cover - this is not going to peel away at the edges as can be expected from most other Bibles nowadays, including all the Cambridge Bibles that I have purchased lately. 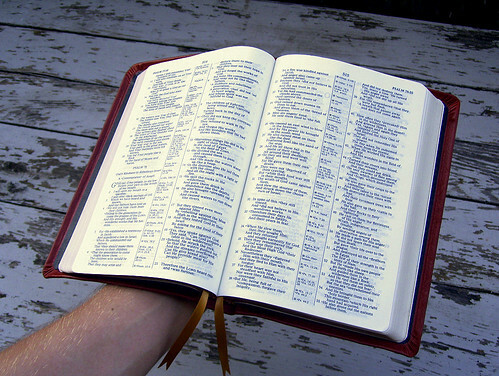 This is not the usual cheapo stuff most Bible manufacturers use. 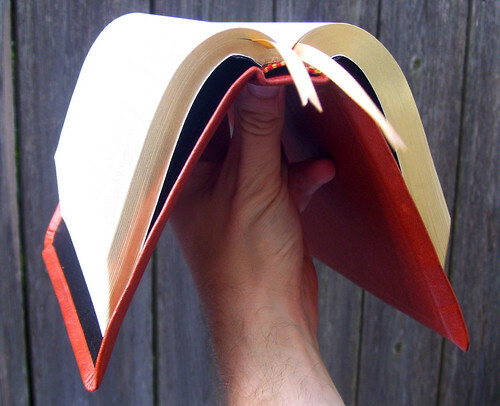 I was a little surprised at how stiff the covers are, but I actually like it because it allows me to hold the Bible with one hand and have both pages laid out for ease of reading (as can be seen in one of the photos I've provided). But at the same time, the cover is very flexible in its ability to open and drop down to the ground (again as demonstrated in one of the photos). I suppose you could request a thinner board to be used under the lining, but I didn't specify anything in that area. Corry even went out of his way to reinforce the stitching of the Bible. The spine was a little tight at first, but with some work pressing the signatures apart in the middle, it loosened right up. 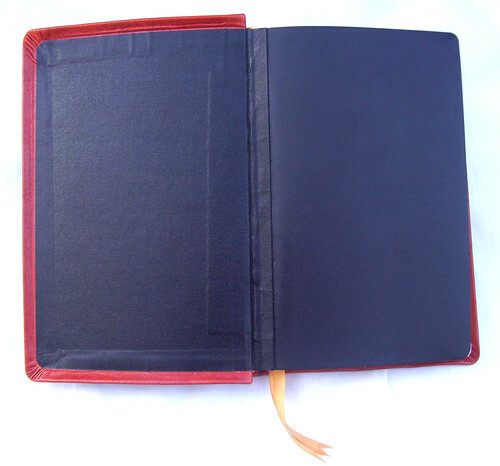 He also uses a unique "hinge" apparatus as can be seen on the inside of the covers (presented in one of the photos), a little piece of the lining folded over on itself and bonded to the spine and endsheets. This, the McSpaddens explain, allows the Bible to open up without putting any pressure on the textblock, ensuring long-life of the binding and limpness of the cover. Truly excellent craftsmanship. Thank you so much Mark for your website. May the knowledge and interest in fine Bibles and bindings be spread far and wide! And thank you, Nick, for sharing the results of your project. 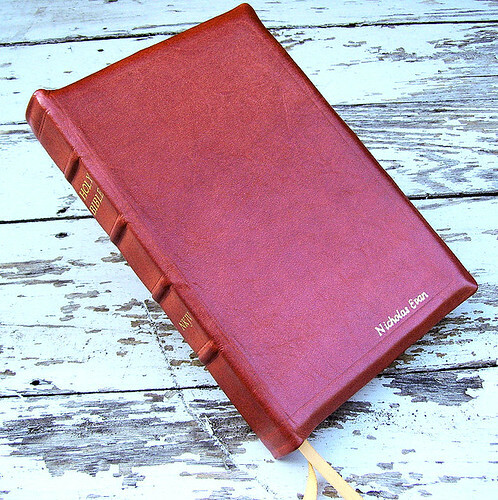 While I was impressed with the workmanship and appearance of the Bible, be forewarned that you will essentially have your Bible turned into a hardback if you go with McSpadden. That was my beef with the rebind: a thin sheet of beautiful leather glued over super stiff boards and plastic lining. Don't even think about doing yoga with it, either. I'm sorry to hear this. Hopefully with use some flexibility will be restored -- but of course, thick boards aren't going to thin themselves out. Why is it that so many rebinders focus on the stiff, over-engineered product? I have a two-fold theory. First, most of the info out there about bookbinding concerns the restoration of antiquarian hardcovers, so an aspiring craftsman looking for training related specifically to the classic "limp" Bible might have a hard time finding it. 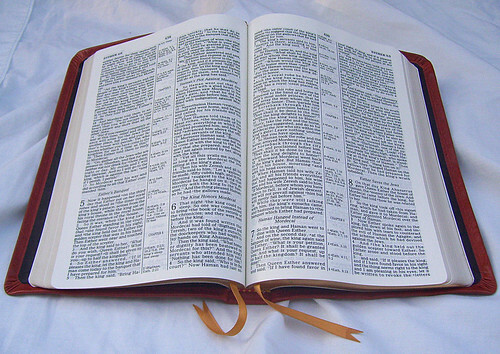 Second, the rebinding market emerged in response to Bibles wearing out, so delivering a drum-tight, indestructible rebind might have been seen as a virtue. 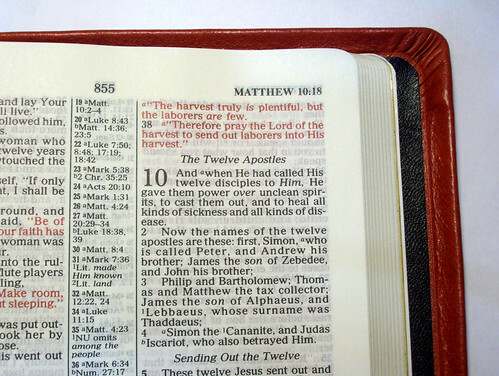 Having a new Bible rebound for reasons of quality and aesthetics seems to be a relatively recent phenomenon. In fact, I don't know of a single rebinder who specializes in the limp Bible. Our little community desperately needs one.